This bracelet is great for an REGISTERED NURSE! Fully adjustable slide on rose gold plated stainless steel wire charm bangle bracelet. These bracelets are a great addition to any jewelry box! Affordably priced, these charm bracelets are trendy and modern. Just squeeze to open more and slide over hand on to wrist. Stackable. Add as many charms as you like to each bracelet! The possibilities are endless! ADD A SWAROVSKI CRYSTAL DANGLE! See other Single and Stacked bracelets here. RN (REGISTERED NURSE) Gold Adjustable Charm Bangle, Nurse bracelet, Charm Bracelet,One Size Fits Most! 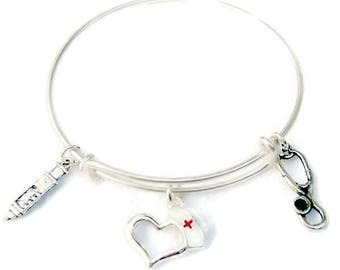 RN (REGISTERED NURSE) Adjustable Charm Bangle, Nurse bracelet, Charm Bracelet,Stainless Steel bangle, One Size Fits Most! Nurse, Nursing Assistant Adjustable Charm Bangle, Charm Bracelet,Silver Plated bangle, One Size Fits Most! PHARMACIST, Stainless Steel Adjustable Charm Bangle, Charm Bracelet,Stainless Steel bangle, One Size Fits Most! 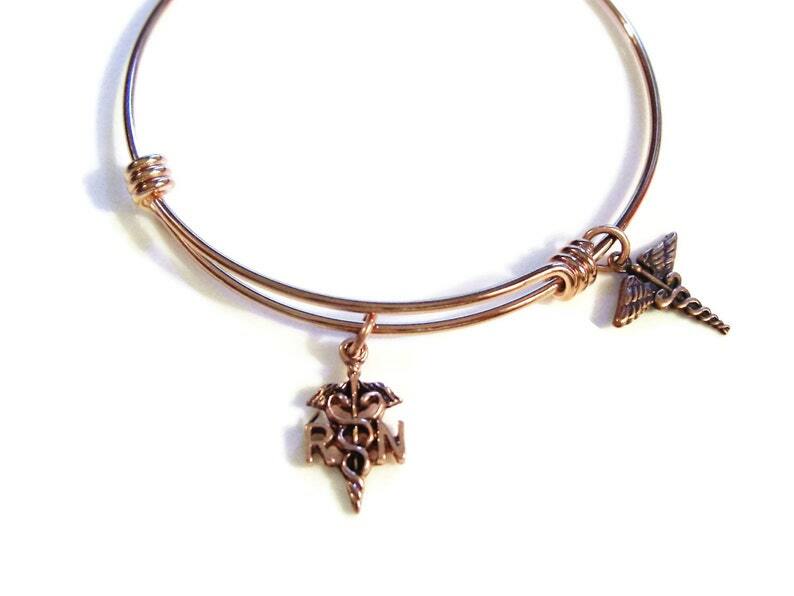 PHYSICAL THERAPIST Adjustable Charm Bangle, Charm Bracelet, One Size Fits Most! OCCUPATIONAL THERAPIST Adjustable Charm Bangle, Charm Bracelet, One Size Fits Most! PHARMACIST, Pharmacy Technician Adjustable Charm Bangle, Charm Bracelet,Stainless Steel bangle, One Size Fits Most! EMT Adjustable Bangle, Charm Bangle Bracelet,Silver Plated bangle, One Size Fits Most! PARAMEDIC Adjustable twisted stainless steel Bangle, EMT Charm Bangle Bracelet, One Size Fits Most!